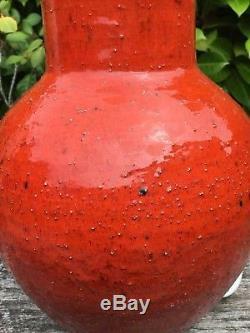 Vintage retro MidCentury modern hand thrown studio pottery table lamp. Has a European feel to it - possibly Italian? Good overall condition with wear and marks consistent with age and use. 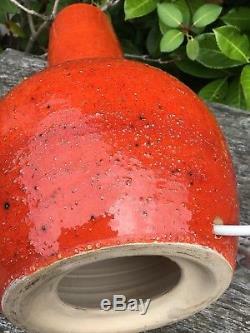 Approx 15.25 tall to base of bulb holder. 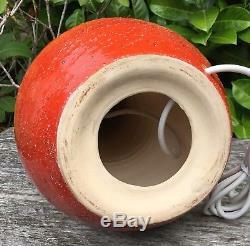 The item "Vintage Retro MidCentury Modern Studio Pottery Red Orange Textured Lamp Italian" is in sale since Monday, November 5, 2018. This item is in the category "Antiques\Antique Furniture\Lamps\20th Century". The seller is "delightful_finds2016" and is located in Lightwater, Surrey. This item can be shipped to United Kingdom, Austria, Belgium, Bulgaria, Croatia, Cyprus, Czech republic, Denmark, Estonia, Finland, France, Germany, Greece, Hungary, Ireland, Italy, Latvia, Lithuania, Luxembourg, Malta, Netherlands, Poland, Portugal, Romania, Slovakia, Slovenia, Spain, Sweden, Australia, United States, Canada, Brazil, New Zealand, China, Israel, Hong Kong, Norway, Indonesia, Malaysia, Mexico, Singapore, South Korea, Switzerland, Taiwan, Thailand, Chile.